Directions from Nabisco Fun Fruits Nickelodeon Fruit Snacks®. 4. Now carefully draw in the nose starting from and ending on the vertical drawing line. Add two squares for his buck teeth. Draw in his shirt collar and tie. Now for his shoes, draw a peanut shape that will go over the circles you drew there before. 5. Draw in the pupils. Add freckles and the lower lip line. Start to draw his fingers. Make his belt loops as simple rectangles. Draw in two small rectangles at the base of his heel. Oh, and draw in three curved lines just under his knees on each leg for his socks. 6. 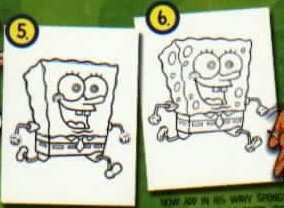 Now add in his wavy spongy outline, add in his spots. Complete thefingers and finish his shoes by carefully adding the bottoms.